Hamar Laser’s Read10-2D is an easy-to-use readout program that runs under Microsoft Windows on a laptop computer or tablet-PC. The software can support as many as four 2-axis targets utilizing Hamar Laser’s R-1307-900, R-1307-2.4 and R-1307-2.4ZB Readouts used with theA-910-900,A-910-2.4 andA-910-2.4ZB Radio Receiver/Hubs. The software features indicators for battery life and background light for each target. Readings may be viewed for a single target, for the measuring and reference targets separately, or for all four targets simultaneously. The Options Menu allows the user to easily change and save settings for units, tolerances, resolution display preferences, communication parameters and other program features, and collected data may be previewed and exported to an Excel spreadsheet for report generation and printing. 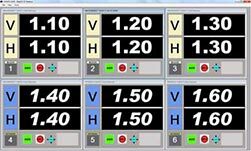 To change measurement/display units, resolution and the deviation from centerallowable tolerance (±), select the Units and Tolerances Tab. Measurement/Display Units can be selected from millimeters, inches or microns. Resolution changes the number of decimal places (for example, from .1 to.123). Deviation from Center-Allowable Tolerance enables measuring and reference target tolerances (both the Horizontal and Vertical axes need to be in tolerance for the readout numbers to turn green. Select the to change the colors used in target display boxes or to invert colors. Display Settings Tab Check the Coordinates box to change V/H to Y/X. Select the Communications Settings Tab to change the COM port used and the target polling settings. The signal bars for Targets 1-4 indicate the communication efficiency rate. Advanced settings allow the correction of interference from other wireless systems operating in the same area.